Breath sounds are the noises produced by the structures of the lungs during breathing. 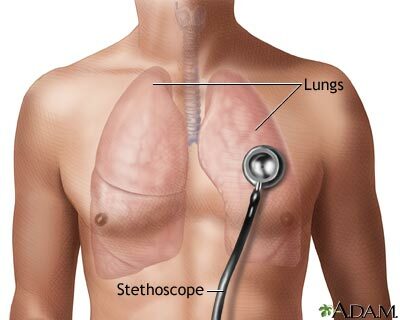 The lung sounds are best heard with a stethoscope. This is called auscultation. Normal lung sounds occur in all parts of the chest area, including above the collarbones and at the bottom of the rib cage. Using a stethoscope, the doctor may hear normal breathing sounds, decreased or absent breath sounds, and abnormal breath sounds. Rales. Small clicking, bubbling, or rattling sounds in the lungs. They are heard when a person breathes in (inhales). They are believed to occur when air opens closed air spaces. Rales can be further described as moist, dry, fine, and coarse. Rhonchi. Sounds that resemble snoring. 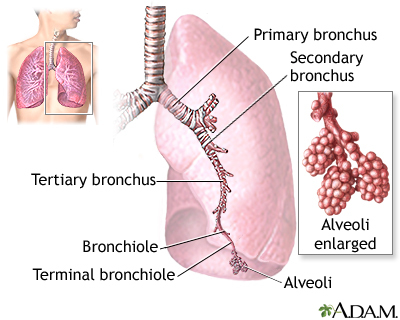 They occur when air is blocked or air flow becomes rough through the large airways. Stridor. Wheeze-like sound heard when a person breathes. Usually it is due to a blockage of airflow in the windpipe (trachea) or in the back of the throat. Wheezing. High-pitched sounds produced by narrowed airways. Wheezing and other abnormal sounds can sometimes be heard without a stethoscope. Contact your health care provider if you have wheezing or other abnormal breathing sounds. Your provider will do a physical exam and ask you questions about your medical history and your breathing. When did the breath sound start? How would you describe your breathing? The provider discovers abnormal breath sounds in most cases. You may not even notice them. Ball JW, Dains JE, Flynn JA, Solomon BS, Stewart RW. Chest and lungs. In: Ball JW, Dains JE, Flynn JA, Solomon BS, Stewart RW, eds. Siedel's Guide to Physical Examination. 8th ed. Elsevier Mosby; 2015:chap 13.